Louvre Abu Dhabi on Wednesday announced it will open its doors to the public on 11th November 2017. It is the first museum of its kind in the Arab world: a universal museum that focuses on shared human stories across civilisations and cultures. On display will be the museum’s important collection of artworks, artefacts and loans from France’s top museums. These span the entirety of human existence from prehistorical objects to commissioned contemporary artworks, highlighting universal themes and ideas and marking a departure from traditional museography that often categorises according to origin. In addition to the galleries, the museum will include exhibitions, a children’s museum, a restaurant, a boutique and a cafe. 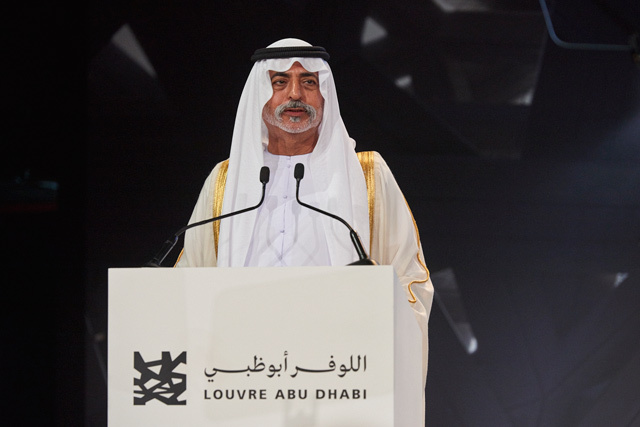 Mohamed Khalifa Al Mubarak, Chairman of Abu Dhabi Tourism and Culture Authority, TCA Abu Dhabi, and Tourism Development and Investment Company, TDIC, said, "Louvre Abu Dhabi embodies our belief that nations thrive on diversity and acceptance, with a curatorial narrative that emphasises how interconnected the world has always been. The museum represents the latest innovation in a long-standing tradition of cultural preservation nurtured by the founding leaders of the UAE. Louvre Abu Dhabi forms one element of Abu Dhabi’s cultural strategy, which safeguards our rich heritage and catalyses creativity. Investment in a vibrant cultural ecosystem supports the UAE’s economic diversification and development as a modern, dynamic society. Louvre Abu Dhabi will inspire a new generation of cultural leaders and creative thinkers to contribute to our rapidly-changing and tolerant nation." 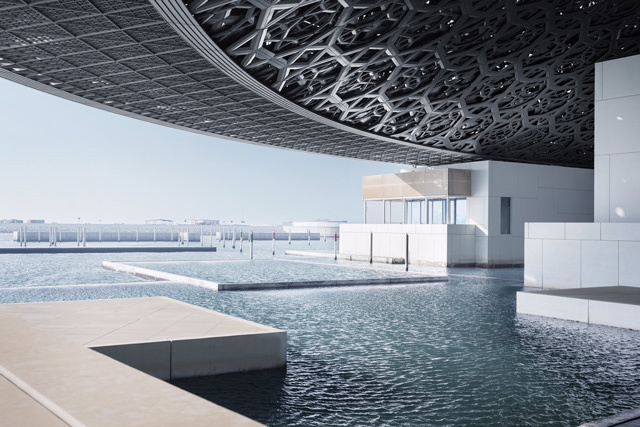 Louvre Abu Dhabi’s story will begin in the "Great Vestibule", where visitors are introduced to important themes such as maternity and funerary rituals. The dialogue between works from different geographical territories, sometimes far apart, highlights similarities between the canons despite each having its own mode of expression. The galleries will be both chronological and thematic, and subdivided into 12 chapters. Displays include works from the earliest empires, including the first figurative representations, such as the Bactrian Princess created in Central Asia at the end of the 3rd Millennium BCE, funerary practices of ancient Egypt illustrated by a set sarcophagi of Princess Henuttawy, and the creation of new economies with a Decadrachm coin of Syracuse signed by the artist Euainetos. A gallery dedicated to universal religions will feature sacred texts: a leaf from the "Blue Quran", a Gothic Bible, a Pentateuch and texts from Buddhism and Taoism. The artistic exchanges on the trading routes during the Medieval and Modern periods are brought to the fore through an important number of ceramic works. Between Asia and the Mediterranean, and then between Europe and America, guests will appreciate how the world’s horizon gradually expanded. A set of screens from the Japanese Namban demonstrate the dialogue between the Far East and Europe. From the image of the Prince throughout the world, illustrated by an important Ottoman Turban Helmet, to a more intimate vision of a new art of living, the museum presents an exceptional chest of drawers made in Red Chinese lacquer by Bernard II Van Risenburgh (1696 - 1766), created in France. In a section about Modernity are Edouard Manet’s (1832 - 1883) the Gypsy, Paul Gauguin’s (1848 - 1903) Children Wrestling, Piet Mondrian’s (1872 - 1944) Composition with Blue, Red, Yellow and Black. Also on show will be a monumental work by the artist Ai Weiwei (1957- ) and his questioning of globalisation. American artist Jenny Holzer (1950 -) has created three engraved stone walls named 'For Louvre Abu Dhabi', 2017. These cite important historical texts from Ibn Khaldun's Muqaddimah, the Mesopotamian bilingual (Akkadian / Sumerian) Creation Myth tablet, and the 1588 annotated edition of Michel de Montaigne's Les Essais. Italian artist Giuseppe Penone (1947 - ) has produced several works specifically for Louvre Abu Dhabi. Leaves of Light (2017) is a vast bronze tree with mirrors placed in its branches to reflect the ‘rain of light’. Propagation (2017) is a wall of porcelain tiles that depict hand-drawn concentric circles originating from the fingerprint of the late Sheikh Zayed bin Sultan Al Nahyan, the UAE’s founding father. It was produced in France. Francoise Nyssen, the French Minister of Culture said today in Abu Dhabi, "The opening of the Louvre Abu Dhabi on 11th November 2017 will be a milestone in the development of the cooperation between the United Arab Emirates and France, ten years after the signature of the intergovernmental agreement. This museum is one of the most ambitious cultural projects in the world, brought to light by Jean Nouvel’s exceptional architectural masterpiece. 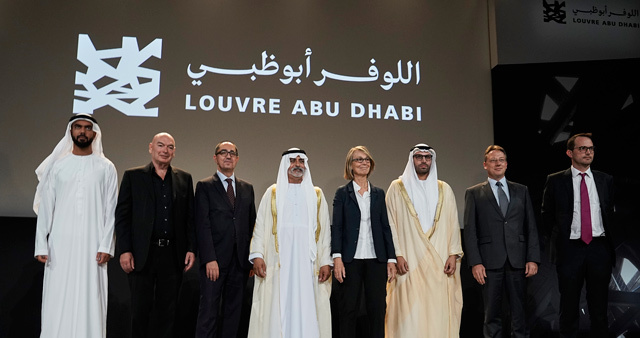 With the expertise of its cultural institutions and loans from its national collections, France is particularly proud to play a significant role in the completion and the life of the Louvre Abu Dhabi, for now and for several decades to come. "Endowed with an innovative scientific and cultural project combining the expertise of 13 French museums and institutions steered by Agence France-Museums, the Louvre Abu Dhabi will offer visitors a unique experience: a brand new journey through major works of art from different civilisations, mirrored to reveal our common humanity. The Louvre Abu Dhabi therefore carries a message of tolerance and peace and stresses the unwavering commitment of our two countries to promote culture and education as a shield against extremism. "The inauguration week will also feature two prestigious events coproduced under the French-Emirati Cultural Programme, that was initiated over a year ago by our two countries and supported by the creative momentum generated by the Louvre Abu Dhabi. I have the hope that the Louvre Abu Dhabi will always bring this energy further, inspire new callings, promote mutual understanding, and always reinforce the strong bonds uniting the United Arab Emirates and France." 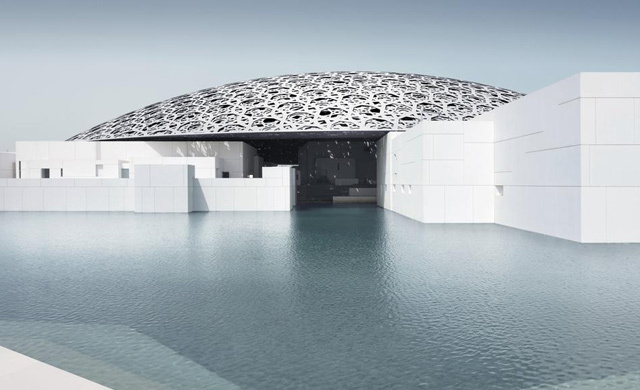 Manuel Rabat, Director of Louvre Abu Dhabi, said, "With a unique global narrative and a vision to explore the history of art in a fresh context, Louvre Abu Dhabi is a place where visitors can come to understand their own and others’ cultures. Its ground-breaking architecture complements a presentation of exceptional treasures that represent a snapshot of humanity’s creativity, and paves the way for new discussions." Jean-Luc Martinez, President-director of the Louvre museum and Chairman of the scientific Board of Agence France-Muslums, who was also in Abu Dhabi for the announcement, said, "This joint announcement honours the completion of a magnificent project with which the Louvre is proud to have associated its name and to claim the spirit of it - the creation of the first universal museum in the Arab World. I am delighted to see that we are entering the final phase of a project with a spirit of openness perfectly aligned with the true nature of the Louvre - it is my wish that from Saadiyat Island, it will be carrying out this inspiring world awareness mission to future generations." 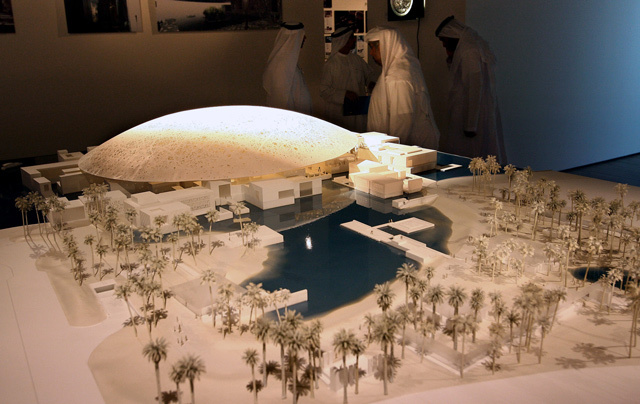 Jean Nouvel, the architect of the Louvre Abu Dhabi, said, "Louvre Abu Dhabi will open in two months. After several years of studies and construction, guests will be able to enter this place of light, this revelatory meeting place of a number of planetary cultures beyond the seas and centuries. It is an architecture that is protective of its treasures, it is a homage to the Arab city, to its poetry in geometry and light, and, under the large cupola, it is an evocation of the temporalities which inexorably punctuate the hours, days, and the passing of our lives." In the galleries, important artworks on loan from 13 leading museums in France will be presented. Highlights include Leonardo da Vinci’s (1452 - 1519) La Belle Ferronnire (on loan from Musee du Louvre), Vincent van Gogh’s (1853 - 1890) self-portrait (Musee d'Orsay et de l'Orangerie), a rare ivory saltcellar from the Benin Empire (Musee du Quai Branly - Jacques Chirac), a Globe by Vincenzo Coronelli (1650 - 1718) (Bibliotheque Nationale de France), a pair of gui vessels (Musee National des Arts Asiatiques Guimet), Jacques-Louis David’s (1748 - 1825) Napoleon Crossing the Alps (Chateau de Versailles), Auguste Rodin’s (1840 - 1917) Jean d’Aire from the group 'The Burghers of Calais' (Musee Rodin), a 13th century reliquary chest (Musee de Cluny - Musee National du Moyen Age), a Chinese ewer of Persian shape (Musee des Arts Decoratifs), a Breastplate of Marmesse (Musee d'Archeologie Nationale - Saint Germain en Laye), the Apollo Belvedere statue by Primatice (1504 - 1570) from Chateau de Fontainebleau, and Standing Woman II by Alberto Giacometti (1901 - 1966) from Centre Pompidou. The inaugural special exhibition, 'From One Louvre to Another: opening a museum for everyone', opens on 21st December, 2017, and traces the history of Musee du Louvre in Paris. Divided into three sections, the exhibition will look at the royal collections at Versailles under King Louis XIV, followed by the residency of the Academy and Salons in this palace for artists, and conclude with the creation of the modern Musee du Louvre. It will feature approximately 145 significant paintings, sculptures, decorative arts and other pieces from the collections of Musee du Louvre and Château de Versailles. The exhibition is curated by Jean-Luc Martinez, President-Director, Musee du Louvre, and Juliette Trey, Curator, Prints and Drawings Department, Musee du Louvre.